The SOLID Interceptor® is the latest local and innovative storm water management product. It is designed to meet storm water quality regulations by capturing pollutants before it enters our natural drainage system. It is designed to be an offline system and capturing floatables, trash, gross debris, fine sediments, oil and grease. The SOLID Interceptor® isolates, screens, and traps litter and debris from storm water runoff. Flow and screening controls physically separate captured floatables, preventing re-suspension and release of previously trapped pollutants. The SOLID Interceptor® protects downstream waterways by targeting and removing trash, debris, and coarse contaminants at high flow rates. Direct screening of flows guarantees removal of solids larger than the screen perforations. The SOLID Interceptor® is ideally suited for installation at the collection source in small catchment areas and is designed to remove gross pollutants, organic waste, silt, sediment and oils. The polymer construction makes it light and easy to use. The SOLID Interceptor® is a storm water management tool for urban or rural installations. Its structural design and construction materials are designed for long term and continuous operation. • The unit operates by integrating with the existing drainage system. • Designed for continuous operation. 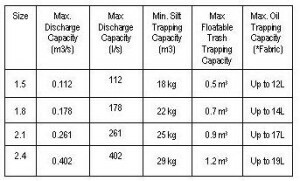 • Capacity to handle large water volumes . • Require only minimum civil works. The SOLID Interceptor® has an ongoing maintenance requirement. Routine inspections are necessary to schedule cleanings. To ensure proper performance and efficiency, the system must be cleaned. The rate at which the system fills will depend more heavily on site activities rather than size of the unit.